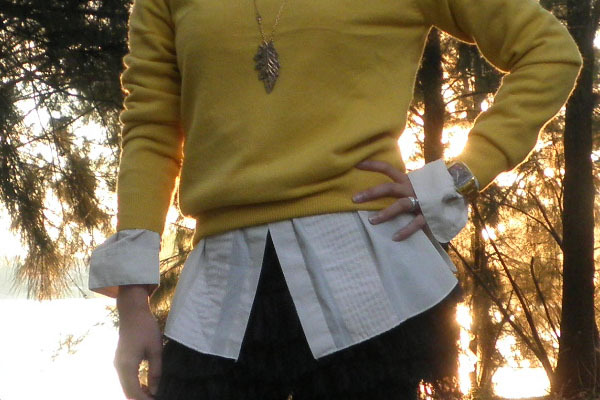 The yellow sweater actually has a pink sister, but today I decided to wear yellow. Pink on midnight blue might make the outfit dark. In my opinion (disclaimer: not necessarily an expert one) yellow makes a perfect contrast on anything that has a strong blue-base. The shirt is really a men's tuxedo shirt complete with pleats, button-down collar and french cuffs (the cuffs can be folded back and fastened with links). This shirt was thrifted (as usual, hello!) from a girlfriend doing a garage sale (first dibs!) so my husband need not to worry. I got the skirt from SM's Children's Wear Department a year ago. Obviously, the shoes is becoming my favorite. I bought it in Manila from a shop called Shoebox in Rockwell (and I also think they have a kiosk in Greenhills), their shoes are stylish, comfortable and most importantly- affordable. Actual photo of the sky, no edits. I could not resist taking a picture of the autumn sky (at 7:30pm). It was magnificent! It looked menacing and lovely at the same time. Terrible and beautiful, light and dark all creating a picturesque scene which left me struck.